This pretty wrist rest will provide comfort when using your computer. You can decrease the size by adding fewer motifs to the width and/or length. 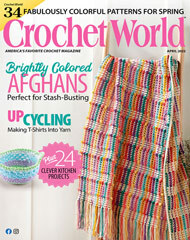 This e-pattern was originally published in the February 2013 issue of Crochet World magazine.